IPRO honored CommonSource, LP at its two-day 8th Annual Partner Conference, IPRO Innovations 2009. 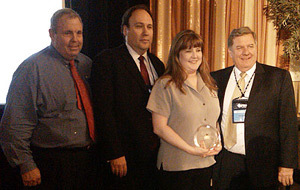 CommonSource, based in Houston, Texas, received recognition for Medium Market Leadership and Innovation. The conference, held at the Pointe Hilton Squaw Peak in Phoenix, Arizona featured more than 20 specialized workshops and seminars to provide more than 200 attendees with important hands-on knowledge and comfort in the quickly evolving world of litigation support software. The criteria for selection includes consistent dedication to technological innovations and leading edge business paradigms to streamline business practices, achieving top quality service levels, and positively impacting the litigation community in their market over the last year.